Click here to visit “Downfacebookvideos.com“. Then enter your Facebook video link. Let say we want to download this funny video I found on Facebook. 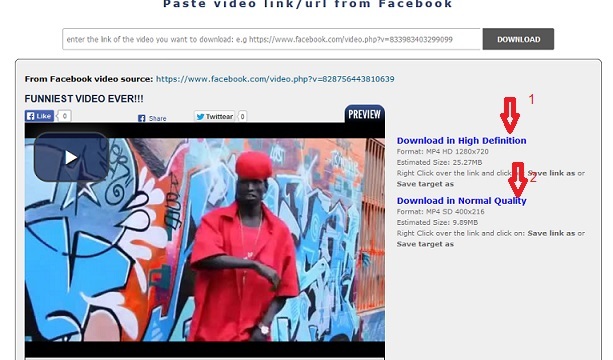 Then paste the link on the space provided for it on DownFacebookVideo and click the “Download” Button. Then right click on the link 1 or 2 and click on Save Link as or Save target as to save as high definition or normal quality respectively. Do you know of other means of downloading Facebook videos? If you have any questions or contributions, please use the comment section below. Perfect tutorial to download facebook videos, I was using IDM for downloading videos and sometimes it won’t work. Will surely try this software. First visit to your site. Really impressed. Very nice tutorial as I was searching for this video downloading trick for some-days. You solved my problem. Very useful post.your steps are Perfect for download videos from Facebook.I hope all facebook user like this post. And I will share this helpful article with my all followers at Facebook.